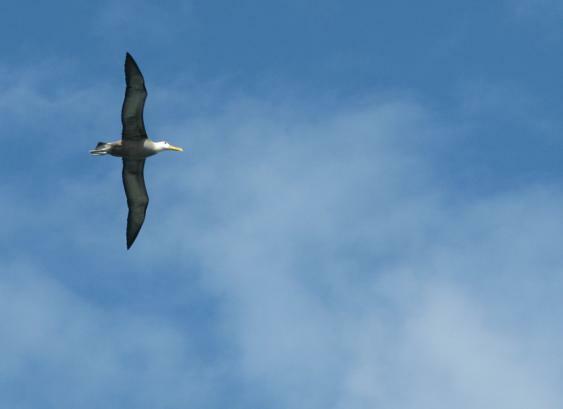 Written in 2009, about my trip to the Galapagos Islands in 2008. There is a place where the wind blows and lifts. 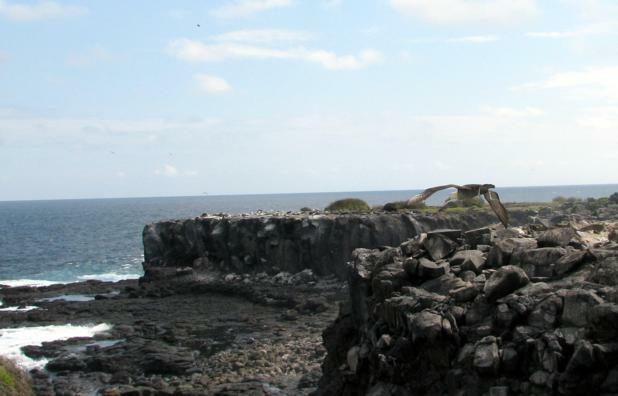 Cliffs on the ocean, looking down on the rocks and marine iguanas, sunning, swimming. The rocks look sharp, young, fresh. Untouchable, distant. Albatrosses walk up, a side-to-side gait, comical with their serious eyes. They reach the edge, spread broad, long wings, longer than they looked, so light, just feather and hollow bone, but strong, so strong for flight. They fall up. The wings are a parachute, the wind a friend, the air comforts, supports, pushes and pulls, holds. The giant bird floats along, moves past the rocks, the shrubby grasses, past life, from the center of vision to the periphery, a distinct form to a small dark dot, moving, moving, gone. To follow—the urge is there. Spread arms and legs, spread dreams, spread soul, and let go. To move away from everything known, into the unknown. To trust, to fly. Is it the flier moving and the word standing still? Or the world moving past in an eye-watering blur and the flier, the bird, held in place, held frozen for a time, measurement suspended? But which way is the fall—up or down? Towards the stars or the rocks—similar, similar; just a difference of distance and iguanas. There is the other choice; to stay. The least attractive, the least risky, perhaps, for the moment. How long does the moment last until the next? A picture does no justice, cannot capture the vitality of the actuality, the breath of the moment. There is only an idea left, a memory of a feeling, a sense of the wonder and the wild, of the perfectly regulated space of time when albatrosses fly.